George Morrell was of Huguenot descent, his ancestors having fled from France to Germany on the revocation of the Edict of Nantes and afterwards came to America. The name was formerly spelled Morele. George Morrell was born in Lenox, Massachusetts, in 1786. He was educated at Lenox Academy and at Williams College, from which he was graduated in 1807; he went on to study law in Troy, New York. He lived in Cooperstown, New York, from 1811 to 1832, during which time he was in the state militia, rising from the rank of sergeant to major general. He was Clerk of the Court of Common Pleas of Otsego County in 1815, and was appointed First Judge of that Court, and re-appointed to that position in 1832. He became Master in Chancery in 1819 and Solicitor and Counselor in Chancery in 1823. In 1832, he was elected a member of the assembly for Otsego. 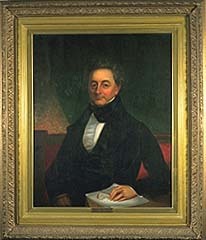 In 1832, he was appointed Judge of the United States Court for the Territory of Michigan by President Andrew Jackson.